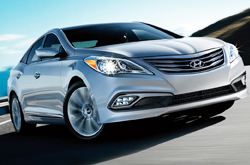 The 2015 Hyundai Azera is a class-leading sedan that offers several luxury features and high-end tech amenities. For its newest model year, the 2015 Hyundai Azera is offering Carrollton drivers even more tech features and style enhancements that are sure to keep the Azera high on sedan shoppers minds. The newly refreshed 2015 Hyundai Azera offers several new features, including a slightly revised grille and a new front and back bumper. It also comes with an updated LED foglight cluster and standard 18-inch alloy wheels on the top tier Limited trim. The sedan's interior also gets a slightly updated restyling, including a new 8-inch LCD navigation screen in its center console and new door sill lighting. On the tech front, our 2015 Hyundai Azera review really loved Hyundai's Blue Link Vehicle Safeguards App, which is now available for download in the 2015 Azera's multimedia system. This new app offers great features to help parents of teen drivers by alerting them of the vehicle's speed, location and when the car is being used. And don't worry, your teen will know when you're monitoring their driving, as an onboard feature lets the teen know when her/his parents are looking at the app. Other tech amenities on the 2015 Hyundai Azera include several award-winning safety features, such as rear cross traffic alerts, blind-spot detection and lane change assist. The 2015 Hyundai Azera carries over its powerful 3.3-liter V6 engine that rates at 293 horsepower and 255 lb.-ft. of torque, as well as its six-speed automatic transmission. 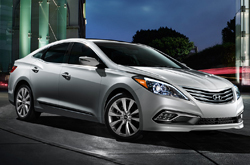 The 2015 Hyundai Azera is now in Carrollton, so come by our showroom to check out this great sedan. For even more information on the 2015 Azera keep reading our 2015 Hyundai Azera review for exclusive pics, a video review and a Dare to Compare feature that shows you how the Azera stands up to its competition. The 2015 Ford Taurus, Toyota Avalon, Buick Lacrosse and the Chrysler 300 are no match for the 2015 Azera! 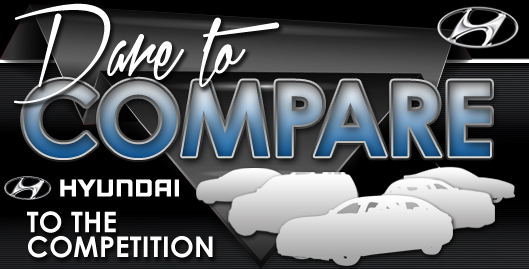 Just compare Hyundai's newest model head-to-head with them and you'll realize that it outshines the competition easily. The Azera's modern features and competitive pricing are just a few of the appealing attributes that shoppers will appreciate. When comparing its price to the aforementioned vehicles you will clearly see that Dallas Hyundai customers select it because it's a spectacular value. Take a peek at our facts list to learn more about the Azera - bullets below this text. Buying a car takes time, research and a little help along the way! 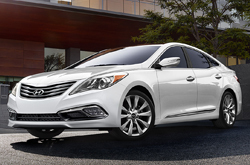 That's why Van Hyundai has provided the Azera review above and reviews of other 2015 Hyundai models. Our reviews are written by seasoned automotive writers - it's just another resource we provide as a respected Dallas area Hyundai retailer. The above article is jammed with worthwhile material - it contains info about fuel economy and other specs so that you can make informed decisions about the Hyundai you want to buy. After checking out about the 2015 Azera, please use the contact form to message Van Hyundai to learn about OEM incentives and lease offers.